Those who are readers of IPWatchdog.com on a regular basis are familiar with the jousting that goes on in the comments between myself and a core group of patent believers and those who are, shall we say skeptical of the value of patents and would prefer that patents simply not exist, or at least not exist in certain areas, such as software. Without getting into that debate directly here and now allow me to observe that if you are an independent inventor, start-up or small business one successful way to responsibly move forward is to pattern yourself on successful companies. There is no mileage in following the lead of a company in decline, so lessons can be learned by observing successful companies and weaving together a strategy that will lead to market success. Perhaps no other company today so aggressively pursues patents on core technologies and products than Apple, and they enjoy enormous success. So why not take a page from the Apple playbook? Innovate, patent, commercialize and dominate. It is hard to characterize Apple as anything other than wildly successful, as indicated by their market dominance and copy-cat products that seek offer substitutes for the iPod and iPhone. So if a highly developed patent strategy is appropriate for Apple, why wouldn’t a patent strategy that fits within your budget be a bad idea for you? The short answer is that if patents work for Apple they can work for you too. Stop thinking that Apple is in a different league and start remembering that like Microsoft, Apple was at one point just two guys. The dynamic duo of Bill Gates and Paul Allen, and the dynamic duo of Steve Jobs and Steve Wozniak, are but two illustrations of the American dream. Starting off small and growing into a mega-giant corporation. In the tech sector these stories are real, and in all cases innovation is followed by proprietary protection. What text should be included in the main part of the logo? What type of product or service do you offer? The Innovation Economy is an initiative focused on strengthening the innovation cluster in Inland Southern California. What do you hope to accomplish with your new identity? When is the deadline for final entries before choosing a designer? The year 2020 seems far away. But when we consider how much we need to achieve over the next decade, 2020 will arrive in a blink. Arizona is a state of independent thinkers. Yet, when polled, most of us agree on key issues. We value our communities, treasure our natural resources, and want the best for our state: a first-rate education system, access to good, stable jobs, and infrastructure that supports current and future residents. With our economy struggling, these may seem like lofty goals, but they are not. These are achievable if we invest wisely in our future and put our differences aside. Contests can be a great way to get recognition for your small business in addition to the big prizes. Check deadlines closely. Our latest list of competitions and awards for entrepreneurs includes an extended deadline and several that are ending in January 2010. This listing is updated every two weeks and brought to you as a community service by Small Business Trends and Smallbiztechnology.com. As locals and University officials wait for the New York State Court of Appeals to determine the fate of Columbia’s planned Manhattanville expansion, a guest commentator for the Center for an Urban Future think tank is calling on the University to increase the economic benefits of the project. In a policy brief released on Thursday, David Hochman—an expert in technology-based economic development—said Columbia should amend its project plan to include more emphasis on private-sector jobs, as opposed to jobs exclusively within the University. Fostering Innovation In China And The US For The 21st Century. 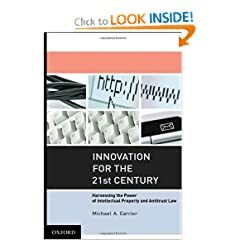 In my recent book Innovation for the 21st Century: Harnessing the Power of Intellectual Property and Antitrust Law (Oxford), I explore the relationship between law and innovation. In particular, I show how U.S. patent, copyright, and antitrust law often stifle innovation. Dan Harris was kind enough to invite me to write a guest post for China Law Blog. And I am pleased to accept his invitation. But I must state at the outset that it is difficult to condense a 400-page book to a blog post! I don’t have the space here to discuss many of my proposals, including those addressing pharmaceutical mergers, standard-setting organizations, peer-to-peer (P2P) software, the Digital Millennium Copyright Act, statutory damages, biotechnology research tools, and material transfer agreements (MTAs). 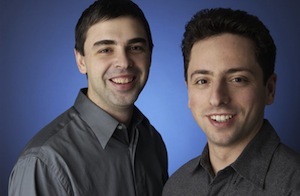 Google revealed a plan today for co-founder Larry Page and Sergey Brin to sell off some of their company stock, with the end result that the pair’s voting power will drop below 50 percent. The news was revealed in a regulatory filing disclosing a plan that Page and Brin made last November to sell off about 5 million shares each. It’s described “as part of their respective long-term strategies for individual asset diversification and liquidity.” The sale, which will take place over five years, will decrease their voting power from 59 percent to 48 percent. To commemorate its 100th birthday this year, Kent State University commissioned a study to quantify its impact on the region's economy. One figure it revealed at a gathering of 100 alumni and business leaders Thursday: $1.9 billion. That's the average annual added income of Kent State's eight campuses and its alumni — and is the equivalent of 1.5 percent of the Northeast Ohio economy. The report, titled ''Prosperity By Degrees: The Economic Impact of Kent State University on Northeast Ohio,'' examines it as an investment and engine of growth and prosperity. Yes, my [Tom Slater] headline is a bit facetious. But even if Apple’s tablet doesn’t save the planet, its users will be cutting carbon in three major industries. Music, books & printers could all be, to some extent, displaced by lightweight mobile computing like the Apple tablet. The iSlate is expected to be a touch screen computer with similar features to the iPod Touch but larger, about 10-11″. I say expected because everything is a rumor at this point — though Apple has invited journalists to see their “latest creation” at a press conference on January 26 & 27. So how will the iSlate help? For one thing, every time a real, physical CD (remember those?) is purchased, it is the product of an extensive supply chain. Raw oil is processed into plastics. Plastics are turned into CD blanks. CDs are burnt en masse and liner notes are printed with a variety of synthetic inks. The product is shipped (usually) in little plastic jewel cases which are as fragile as they are infuriating to open with scraps of tape sealing them shut. It is all done on costly machinery in large rooms with fluorescent lighting and the product is transported in a diesel burning truck. Toxic materials, electricity and transport can all be eliminated from this industry by going digital. According to a new report from Gartner, worldwide revenue from mobile applications will total $6.8 billion in 2010, an increase of 60% over the $4.2 billion spent in 2009. Growth in revenue from mobile apps can be expected to continue at a rapid rate, as more consumers purchase smartphones and more apps become available. Gartner predicts that in 2013, 21.6 billion apps will be downloaded, generating nearly $30 billion in revenue — more than a fourfold increase over 2010. 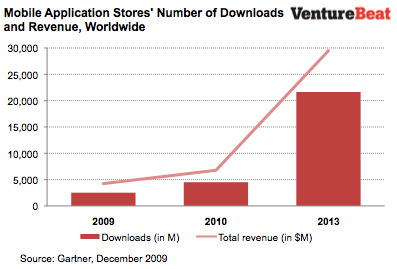 Gartner forecasts that 82% of all downloads will be free in 2010, and that the share of free apps will increase to 87% by 2013. This leaves mobile advertising to make up for the loss in share for paid apps — Gartner claims that in 2010, 0.9% ($0.6 billion) of mobile app revenue will be generated by advertising. Gudrun Flieger tucks into a steaming bowl of bean stew at a soup kitchen in the well-to-do Berlin district of Charlottenburg. The 63-year-old pensioner has been a regular guest at the church-run meeting point since losing her job as a fitter at an electrical factory which went bankrupt in the late 1990s. "Without the soup kitchen and state help I'd be lost," she says. At a pawn shop on Karl Marx Strasse, in Neukölln, one of Berlin's poorest districts where one in four people are unemployed and half of all children live in poverty, an elderly woman in her 70s, dressed in a fur coat, hopes to pawn a family heirloom – a gold watch – to help cover a heating bill.